Content is the core component of any successful website and business online and in this video you are going to be walked through the process of creating your initial base of content on your website. 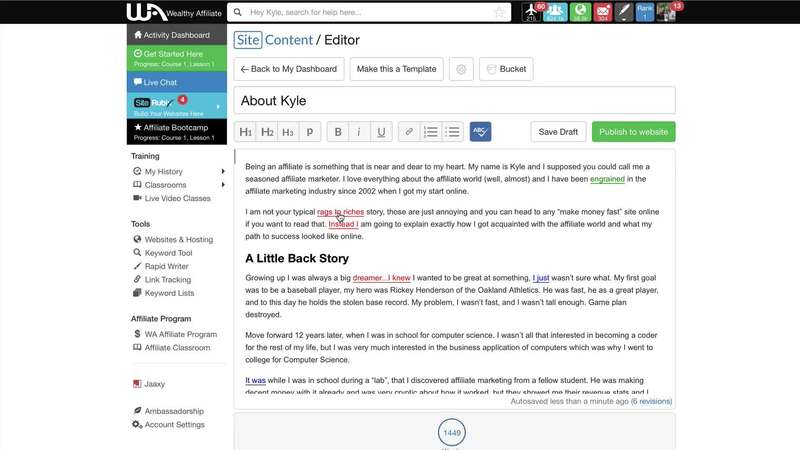 You are also going to be introduced to SiteContent and how to utilize SiteContent templates and the SiteContent editor. In this video you are going to learn. If you have any questions about the initial set-up of your content framework, please leave them below and I will be more than happy to help you out. Kyle, I have gone through the site content platform, and 1 question I have is about the menu. I have put my privacy, Affiliate Disclaimer and I added one for Cookies. So I have to put the Privacy on the top menu? I see so many with it in the footer. I also know I should note an affiliate one above or on the side. Your thoughts? Going thru this bootcamp is really helping me fix quite a few things that I thought I had straight. I have had my Niche website up for about 2 months and though I'm continuously trouble shooting, there are things that I totally over looked and needed to update. -If you get stuck on anything, especially framework, or cut and paste, ask your fellow WA students, and go to the help center, ask Kyle and Carson, and ask about cut and paste from your Librarian, It worked for me, good luck! I really do appreciate the manner in which the training videos by Kyle are presented. He explains all points in detail without making me feel less than, illiterate, or uneducated in this field. Even though I may never have performed these tasks before and I don't quite understand some of the information, I know that I will when I actually do the work. Kyle does an excellent job of reassuring me that I can and will come to understand all the information. Thank you for that, Kyle. I look forward to each task instead of dreading them . Awesome Kyle! The value of the content you are offering to members of WA far exceeds what you are charging! I couldn't go anywhere else online or at an in person class and receive the instruction I am afforded as a member of WA! Thank you so much! This platform and community is what I have needed and been looking to find! I am totally in awe of what you and Carson have created and now sharing with others! 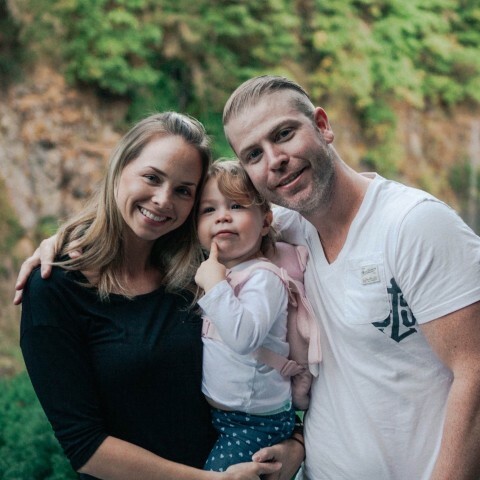 Hi KYLE, The video is great and very informative, easy to follow, but my question is : I am new to Affiliate Marketing, i am still learning about it, i don't have a history to tell about this business, what should i write on the " About Me page? I have been a nurse for nearly 40 years, Can i write about myself and the niche i chose which is Health, wanting to help people to live a healthy lifestyle and giving them advice on different health topics. Would this be ideal? Please advice. I don't know what to write on this part. hi Xilavi, this is a great starting point to add in your about me page, you'll always be able to edit it later on, go with the one which best describes why you like your topic and your experience with it. I think the point at this stage is to communicate who you are and what you've done in your life that relates to your choice of health as your niche, and which people can relate to. I think it's fantastic and I admire that you've been a nurse for so long. You don't have to be an expert affiliate like Kyle in to 'promote' yourself, your niche and your health recommendations site. You are promoting your niche interest not affiliate marketing, which is Kyle's. I'm also a newbie at this so I hope this is correct information I'm giving. I think it is. Please someone else answer if not! thank you. All good luck and blessings to you. You have already made a huge contribution. I really love how thorough all of the lessons have been thus far. As I move through each training, I am more and more astonished by all we are provided through WA. I can't say this enough, there really is no competition! So grateful to be part of this community. When you create Pages, you need to add them your menu. That's probably in the next lesson about menus but here's some training for you: Creating Custom Menus on Your Website Adding Pages to Your Menu It's only when you create Posts, that's when it will just show up on your site on your blogroll. Are you at the back end of your website to find those boxes to check off? Once published, you need to login to your site in the Wordpress admin area, go to Pages, find your Private policy page, and click Edit link, then scroll down there. You should be able to find the boxes there to check off. If not, please let me know. I did all that, it didn't work. Try that again, you may need to open up “screen options” on top right corner of your WordPress screen and you should be able to see if you can show those comment boxes there. Found the screen option tab. I clicked it. What next? Sorry for my delay, see attached, it should be one of these boxes that should be checked so you have those options show up below your post. OK, Going through that lesson now, thanks. Kyle walked me through it, I'm good now, Thanks. I am getting my grammar checked, but when i click on the word it says to use, nothing happens.I also think some of the suggestions are not right(I said "this is the first time", and they suggested to put in "this be the first time", which does not make sense. I guess I am missing something.Can any one tell me what I need to do? Please note that none of the grammar checkers anywhere are exact sciences. I'm a writer and often wonder what the checkers are up to in their assessments. I tell fellow writers all the time to read and re-read their work slowly and out loud. These electronic applications are not designed to TOTALLY replace human review - my opinion. For you, save your work and then refresh your page. The page may be loading slowly. If that doesn't fix the problem, send a message to the Help Desk here at WA. I actually find the spell checker here is wrong more than right. OK I use Australian spelling (after all this is now my country and I respect it) so I just hit ignore either once or all the time. But a lot of other times the suggestions are way out. I sympathize with you because I experienced the challenges having born and lived the former South American country Guyana, which was once a British colony. You will overcome anyway. One of the rules with the words (labour and Saviour) the vowel "u" is omitted in the US. Of course I have lived in the USA for more than 40 years so I have made the adjustment. All I speak and read is English so that isn't a challenge. And I lived for years in Canada so I am quite familiar with USA English. What I am saying here is that the SiteContent spell check leaves a lot to be desired in suggesting alternatives. Not about the differences between US English and commonwealth countries English. I really admire you guys who have conquered English as another language. Whoa, I can't believe it took me a day to do that! But I wanted to make sure I kept checking back with the learning page to make sure I was doing the about me and privacy page correctly. I understand that learning how to do something correctly is time consuming and I'm happy that I have these video's to go back to as many times as I need. Slow but sure wins the race. I have been taking my time also. Sometimes I listen to the video instructions two to three times. You are doing great. Each time I open my Website, I receive a message stating that I am using an insecure browser or an insecure version of Firefox. The message also says that I can have a better experience if I update my Firefox browser. I have attempted to update the browser, but I still receive the same message. Should I dismiss the message? Is there a way to make my browser more secure? The spell checker is a very good tool, but there was some mistakes I found by reading my post that was not picked up, but like I it is a very good tool and it did pick up a lot of mistakes. I would advise anyone to read their post before publishing. Bill, I also find many of the suggestions completely wrong. I have no problem with this if once you ignore something, it would take heed and not bring it up again when you do another spell check! Nothing is perfect, Bill. It's always good practice to read through your own content. Thank you Kyle, this video is awesome. I applied what I learned and got the About Me post and Privacy page on my site. However, I thought that the comment box will not appear on my Privacy page but it does appear. How can I delete it from a page which I do not want my site visitors to comment? You can turn comments on and off on a page/ post level. So what you need to do is login to your actual site, and then navigate to the page or post you are wanting to remove the comments from. 1) Click on the top of your screen where it says 'screen options' and click on that. 2) Make sure the 'discussion' box is checked. 3) Scroll down to the bottom of the page to where it says 'discussion' and make sure the 'allow comments' box is NOT checked. That's it. You can repeat this process to turn comments off and on across any page or post on your site. By default comments are switched on though, so most likely you will only use this to turn comments off. See screenshots for a visual look at the above steps. Thanks for the explanation. It worked for me. Wow! There is a lot of information in this video. I always make notes while I am watching the videos. I think I will need to watch it again before I attempt to do this lesson. I can’t currently think of any questions because the information needs to saturate into my brain. If I do have questions, I will certainly ask them. I am glad I am not the only one who took notes and had to review the video. I know that I will get it figured out but I need a little more time. Here goes, I am now on this phase of the setting up the website, there is quite a lot to learn, Kyle, you are a wonderful teacher, did you miss your calling? Wish me luck in this step at the about me, and site content and setting up the privacy part. I think the about me part is going to take some time for me too. There is a lot to learn in this video but I am determined to get it done. Thank you for your supporting words and let me share this with you . Before I started writing I was a lot uncomfortable about the process to be followed after the content was done. Now i am so amazed on how Kyle made the process so simple it is a question of listen and follow the related explanation tape. I am feeling as a I am an It guy . just joking but it is a very friendly process. You take care DonnaTate1 and all success to you . I am now following you. Where is your url? It is hard to review something without being able to access it. Sure Kyle can find it but he is pretty busy so make it easier for him. Of course, thank you Helen, took my thinking cap off for a moment there. I think mine disappeared mid March! Tried that and couldn't access it. Why don't you put your link on your Profile page bottom right. Watch out for too many spaces at the .s. Hehe, I know what you mean. Aww thank you Helen, thank you so much. No matter how small the help may be it really does go a long way. Whoops, I should have noticed that! No it can't be done until you upgrade. Just remember to include it when you note problems you are having or if you want comments. The "About Me" template was so incredibly helpful! I always have issues writing when staring a blank page. Thank you so much for that template! I am also wondering if someone could look at my about me page and let me know if it's interesting/engaging. I may just be too hard on myself, but I feel like sometimes my writing kind of rambles or just isn't that interesting. I am asking because I am currently on the step trying to write my first product review, but I have no idea if what I currently have (writing style) is really something people want to read. I also don't know if it's ok for me to post the link here, or if that is considered to be promotion. Thank you so much for all the help! This site is really wonderful. Will probably upgrade on day 6 (when my wife gets paid)! I'm a little stuck on writing the "ABOUT ME" page...I think I can write about myself pretty okay, but what does it mean to "BE MY OWN BRAND"??? what is a brand ? How is it MY brand and how can I explain it as a brand? My brand? I had trouble with that too then came to me. Think about how you talk to a friend about your business or even to an employer. How do you present yourself to them on why they should hire you. Your story, why you are here, show who you are. Well, I'm no expert but that is how I approached it and got it done. Don't stress. Just talk to us like here. To get to know you. What do I write for my about me template? I’m on the very first part and I am completely new here so I’m not sure how to stretch out my introduction to even make it a paragraph. It says I need to write a paragraph but I can’t think of anything other than “Hi, my name is Brittany”. I know what to write about myself, but I’m lost on the introduction as far as not making it super short. Brittany, the template is only a guide. So far every template I have used ends up looking totally unlike it did when I started the articles. If you are in doubt have a look at other people's sites and see how they went. I am having the same problem. I can find my page but only if I type in the web address. I can't find how to get to it on my websites home page. Also even though I published it as a page instead of post it still has a section for comments. Any advice would be greatly appreciated. 3. Give it a Name. I was very creative. I called mine Footer 1! 6. Tick the box of the one you want in your menu. 8. Go to widgets. With menu items I use the Navigation Menu. All the info here that I have found says use the Custom Menu but I don’t have this so experimentation led to this choice. 9. Drag the empty box over to the right and drop under either sidebar or one of the subfooters. 10. Click the down arrow beside it to open it up. When you open it up you type in your title and select the menu you want. Did anyone ever figure the problem out? And on the About us page, do not I have to point out these boxes? Hola Sergio perdona por no haberte respondido antes. Yo personalmente no utilizó el Site Content. Pero me acuerdo que cuando empecé lo utilizaba. Lo dejé de utilizar porque las mayorías de mis Sitios Web son en español y no me corrige el texto. Está bastante bien, es rápido. Pero cuando empieces a controlar un poco más rápido WordPress, entenderás lo que digo. Respecto a lo de Premium que comentas, si he entendido bien... dices que no te haces Premium porque para eso lo harías con un plugin. Los plugin buenos hay que comprarlos. Aquí en Premium no. Y hay miles que puedes utilizar. Yo te digo esto porque al principio pensaba lo mismo que tú. Aquí me están sacando todo el rato la palabra Premium. La cuestión es que si quieres dedicarte a esto... WA es el Sitio. Yo he dado muchas vueltas supongo que por lo que cuentas tu también. Mira a tu alrededor y dime si hay algo mejor. Harás lo mismo desde fuera y te gastarás más dinero. Aquí por lo menos tienes apoyo, creo que es lo más importante. Y recuerda por favor.... Es una opinión personal no me mal interpretes. En 'about us page' déjalas en blanco. Entiendo que al principio es un poco Liante. Paciencia amigo. Roma no se construyó en un día. Is it possible to renew a lost content on the website? I published to my website the About Me post/page 2 days ago.Today while doing some editing on the website I have probably done something wrong,and I have lost the whole content of the About Me page except its title.If I publish it again ,Google will mark it as duplicate content. If the current published page isn't showing the content, then it shouldn't be a duplicate content issue. You should be able to view on your WP site drafts you've saved without manually saving it (WP does this, check it). But if you want to be completely safe, just write a new about me page. In the left column of your WordPress back office - look for "All Pages" and "All Posts" - check under both of those to see if you can find the page or post that you lost. Question about "About Me." What are your feelings about having one page/ post that's "About Me" -- and that's my bio, and one that is "About This Site" (or something like that), that states the goals of the site, how I want to help, etc.? I did this on my other business site. I'm pretty good at editing, but I don't want to cut the info about me - -my story/ bio -- down too much, because there's alot of important stuff there, in terms of what makes me and my point of view different. And my goals for the site, what it's all about --- there's a lot to say there too. I think doing the 2 together would be too long. I guess it's up to you really. You could create an 'about me' and 'about __ (sitename). Or you could just create a relatively brief 'about' page, that tells your visitors what you're site is about and why you created it etc-- and link out to more detailed articles about you. This way, you don't confuse your visitors or overwhelm them with lots of details, but you're still giving the people who want more info- more info. If you like you WA profile just link to it. Saves a page and rewriting stuff. That's same thing came to my mind I mean promoting specific niche , don't know how necessary to write about myself ? Wow...it took me 2 days to get through this section...First, because I was trying to make it perfect on what to say...and second...it just took that long. Hello Kyle Donald here, I am making good progress so far and I understand how this entire process works. Lesson 7 is where I am right now Learning to create my initial frame work of content. Very important for the success of any website. The video explained how create a template as well. I will complete Lesson seven tasks so that I can get started on Lesson 8. I almost have level 1 complete. There are 3 more lessons to go, but I am taking my time and absorbing all the information that these videos have. thank you Sophia, how are doing so far? I hope everything is good for you. Keep going Don. I just finished Lesson 7 and will begin on 8 tonight. Slowly but surely my friend. I am creating my About Me page right now as is part of this lesson. I'd like to insert a short YouTube video (that is not from my channel, but supports something I am saying). 1. Do I need permission to use that video? 3. I would love to add a way for them to connect with me, email or social media but I do not see that in the instructions. Am I getting ahead of myself? To need to credit anything you use to its original creator but Youtube videos usually have that automatically embedded so you should be ok.
You should check the License under the video -click on show more and the License is at the end. If it is a Standard YouTube License I guess it is ok for you to use it my friend. I have tried out this Site Content feature, but I am unable to paste text, it makes a mess of it, and I do need to copy and paste my text from Google translate. I write my text in Dutch, then translate it in Google, it's too much work to type it in word for word into the site content. Did you try to insert your copied text from your keyboard with Ctrl + v buttons ? Dear Debbie, I am having exactly the same issue. Did you manage to fix it? No need to reply: I just found the solution in comments below. It seems many of us have had that issue. Great I was just about to answer you but I'm glad you found the answer. Another great in depth instructional video. However, I would have preferred it to be broken down into two separate video's. One on creating your about page so that you can then go away and create your about page while the information is fresh in your mind. What if I'm not ready to have my content and website on line yet. Obviously this is an initial rough draft and not something I want to lay out for the world to see until I get through the lessons and finalize the site. How do I publish content to my website without having it go live? Hi Dennis, my understanding that you do not launch until you are ready. All the training thus far, as I am following along myself, we are still just seeing it ourselves, it is not launched as of yet. Thank you Kyle, neatly done. I have 3 take aways from this teaching. 1. Your soothing voice and attention to detail. 2. Preparation of the initial frame work Template, guides present content outlines and a path for future content layout. 3. Once I complete my draft content I'll review all my errors spelling, syntax & grammar and correct or edit before publishing. Great information, thank you so much. I have a lot to think about and write about now. I do want a pen name because some of my about me story has to do with coming out of abuse. It is part of becoming healthy and growing. So any idea of how to come up with a pen name? Also, how do I make sure the Pen name is not linked back to my name? Oh wow Kyle! What can I say? I am just forever grateful for this tutorial. So much content and very helpful to walk through a newbie like me. This got me excited to start building content in a few websites I created here at WA. Actually, I have just been navigating and learning things as I go and have committed some mistakes along the way. Your tutorial has just revealed what I did wrong. I guess it's totally part of the learning curve. I find this challenging at the same time sparked something in me to start, improve, and hone my writing skills. That got me excited as it has the features of checking the content I will be writing and will result to what like a pro, like you, may have done. A million thanks Kyle. I still have not answered you with the niche question. I may have to send you a private message about that. Thank you. Be blessed! Great tutorial - thank you Kyle. Click on "Screen Options" top right. This will open a menu at the top of the screen. Check "Discussion." While still in the editor, scroll down to the Discussion box near the bottom of the page and uncheck "Allow Comments" and uncheck "Allow pingbacks etc." thank you so much for taking the time to give me advice about this. It was really helpful. I have now been able to turn the comments off for this page. How can I tell if my published page is a Post or a Page? I published my Privacy Page, but at the bottom it allows for comments - my suspicion is that I have a Post instead of a Page. If this is true, I don't know how to correct this error. Hello jimkalke, your Privacy P. is the one you are going to put as your post. You can't receive comments on that. Your pg. is the one you get comments on the one that is about you. Clk pg before you publish it. Clk post for your PP. before you publish it. its me again wanting to make sure I gave you the right ans. to that quest. :) Your PP is the Pg, and the about you will be your Post sorry about that. I am just too encouraged - I would think you would need to take a specific website building course, which I am sure would cost more than the starter "free" account - and it still would not expose you to as much about how to utilize the website as a true tool for marketing. I think you would need to employ a webmaster to ensure site posts are indexed by Google which translates to more traffic and more money, as well as will ensure compliance in displaying the requirements that will attract affiliates and advertisers, and provide visitors with the sense you are professional, credible and a subject matter expert in your selected niche. Netpro14 summarizes the key "takeaways" well. Jmbongo1 hi I was confused about that as well. Thanks to atzortzis for your reply. So to clarify I can do a niche website and a website specifically to encourage people to join WA. As a new member when is a good time to create a site specifically for that purpose. Bearing in mind I would not have achieved anything in terms of income. I may not for some time yet. Lastly am I right in thinking even if you don't want to be doing affiliate work it is still great to be involved if all you ever wanted was to build your own site. For a business that is service related. I've got to questions. the first one is simple. I have noticed the follow me template aftethe names of the other members. Why doesn't it appear on my setting? The second is the following: I thought the About Me would deal with the subject of niche. But in the example in the video, Kyle wrote about something not related to his niche. Can you give some explanation? The About Me page is about you and your website. You can write a little about your background, why you want to help the world within the industry you chose. It's a welcoming message so that people will know what to expect and who you are. It is related to the niche you choose and related to your background and personality. If you need help to create this page let me know. The other question about the follow me templates is something I am not aware of. When I started here this Site Content platform did not exist. Try to ask this question in the live chat section. Many people will be glad to help you out. It has answered my question. Thanks, @ATzortzis. I used site content to write my articles. It was very, very helpful. I went to and fro and added content over and over again. It was very good. Question. I wrote an about me post and I posted it on my website through site content. All went fine. later I decided that I wanted to add my picture and some other pictures into the post. I did that. I wanted these changes to be effected on my post but when I hit edit post it goes to the post but it looks like I can't effect the changes from site content. I have to do it manually on my post on the webpage. 2. Can I repost the same post (updated with the photos) again to the website. Well I surely do need to brag here. It has taken me 3 days but I have accomplished the most difficult task to date for me.My about page has just about finished me. I though have conquered and slayed the dragon. Lost my helmet and broke the sword. I feel like a horse that has been ridden hard and put away wet. Bed is about the only thing I can think of. But we need to share our triumphs as well as failures. I am tellin ya I finally did it. Raises arms like Rocky Balboa. Not sure why but felt good ya know. Congratulations, i really envy you. I just went through the training on creating initial website content and I'm already feeling overwhelmed by the thought of writing "about me". I hope i can sail through this. You so got this. Figuring out what me was a big problem. I simply told my story. Kyle is going to check it out for me and give me some pointers. Verdict is still out so far. I would love for you to check it out too. More input I can get the more likely I am to succeed. it is "simply 1 montanamamma siterubix .com." sorry I can't leave an actual web link. so squish it all together and hopefully that is correct. I know what you mean. it's a good thing. All your hard work will pay off some day. Thank you, Kyle, Well I'm not too good at this writing part, I seem to just go blank, whether It's about me or not. So with that said I better get to my site so I won't be stuck on it like I was in the description part. This video was very helpful as are all of the videos here at WA. It just takes me a minute to get rolling. BPatkins here. I am having a technical problem: I have been on course one lesson 7 for the past week and a half. When I try to complete it I get an error message saying that the program is no longer responsive. Can anybody give me some technical advice or support. I am running windows 10. I'm no expert...at the moment. But I had a problem signing in to my account a few days ago. The solution that worked for me was changing my browser from Chrome to Mozilla Fox. Since then no problem signing in. I know it's not the same as your temporary problem but maybe try loging in from a diffrent browser to the one you maybe using and see whether that helps. Now I'm starting to become scared that all of this material may be way over my head. So many buttons to remember to push, and how to access them. I'm getting into the "rocket science/computer science" aspect of this. A 27-minute video is way too much information all at once. It could have been broken down into three separate videos and I would have understood all of it better. Great video! I am really starting to feel like this will come together just the way I want, by following each of these steps. It's all explained clearly and there is lots of opportunity to review and complete each task so you understand it before moving on. This is exactly what I was looking for! Thanks! "the back office of your website (Wordpress Admin area) through the SiteManager or through SiteContent. When you are within the editor for this page, scroll down to the bottom of the page and you will see the following settings"
I can't seem to find the "editor" and don't know which page I should be on to complete this task. Please help? Was it just me or did you start to have a slight anxiety attack on the About Me Page?! It's getting more real with each step! Had an online business for a year before and previously completed an About Me page, but I gave up on that business because I became frustrated with my lack of knowledge for creating funnels and was spending way too much on marketing. I got chills and a lil wiggly in my stomach in creating this About Me page because I feel like I experienced some minor success working alone from the ground up. With Wealthy Affiliates and pros who are experiencing success online - I'M REALLY GOING TO DO IT THIS TIME. For now, I just removed it. Excellent introduction by you for the contents of website. Each and every steps shown live by you in your video and the same thing explained in writing also. Any newbie can understand the matter easily. Very happy to be here in this community. The Site Content platform, with its Template Feature, clearly shows how advanced the Wealthy Affiliate program really is. Easy to see and understand why it's so popular. So much and so simple is a definite guarantee of all the effort that goes on behind the scenes. Thanks, to all involved in the production of this fantastic Learning Experience.